Zombudoy is an interesting shooter game created by Y8.COM. This game has simple graphics, suitable for those who love guns and zombies. You can experience this game on your browser because it is a flash game. Zombies are hungry and they need food. They have discovered your home and your task in this game is to use all the weapons you have to destroy the zombies that are advancing towards your house. There are 3 modes of play: Play Now - Challenges - Endless. However, at the start of the game, you will have to play in Play Now mode. There are a total of 20 levels in this mode with each level being a challenge for you. 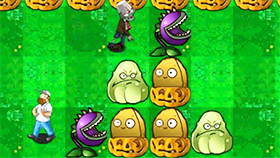 The zombies will appear on the left of the game screen and you will use the stones to throw them. When the zombies die, you will have money. You can use the money to buy more powerful weapons such as machine guns, bombs ... to continue fighting with zombies. Use 1-2-3-4-5 to change weapons. Use Q to switch weapon. Use Ctrl to active night vision. Shooting in the head causes the zombies to die instantly. There are over 35 different weapons available for you in this game.